Designed a character in 2014. I went from a rough sketch to figuring out if I wanted a more realistic, cartoon-like, and it’s body type. Nel is a crocodile (formally alligator) who pretends to be a huge bully, but is a softy deep down. I try to show this bully through his exterior. Second page bottom is his current design I made a year later in 2015. Very first concept I did of Nel. Took this silhouette and ran with it! More conception. Trying to figure out the face shape, body proportions, and playing with possible colors. The final design is on the right side! I redesigned this character about over half a year later. Kept his trade mark pink shirt, but this is when I made him a crocodile instead (crocodile works better with the name Nel in my head). His more rounded beak shows the more crocodile resemblance. I created this piece sometime on August 2015. This is just for my own practice as far as creating Illustrations and working more on my background skills. Below I break down my process. I created this piece near the end of 2015. This is just for my own practice as far as creating Illustrations and working more on my background skills. Below I break down my process. On the side I have been creating an art package to put up on the unity asset store. Unity is a game engine that some programmers use to create games. On the store you can buy code, art and shaders to enhance game aesthetics. I have been making a package that is environment art, so people can just build a grassy fantasy level without having to make the art themselves. I’ve included different trees, rocks, plants, and tillable pieces to create land with. It is still a work in progress, but I plan to release it by the beginning of 2017. At the very beginning of August I started an internship at Seventy7 Studios located in Royal Oak, Michigan. 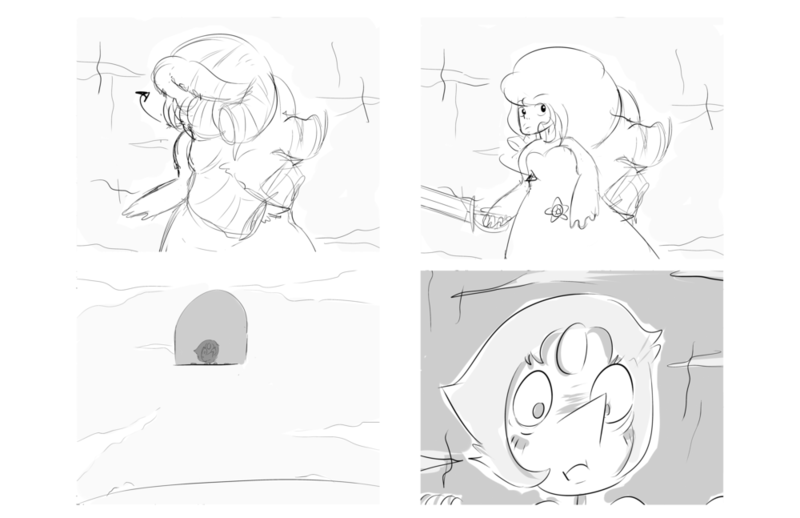 During my internship so far I have gotten to do a couple storyboarding assignments. This is the reason I wanted this internship badly. It is an amazing experience because doing the assignments really pressed me outside my comfort zone. 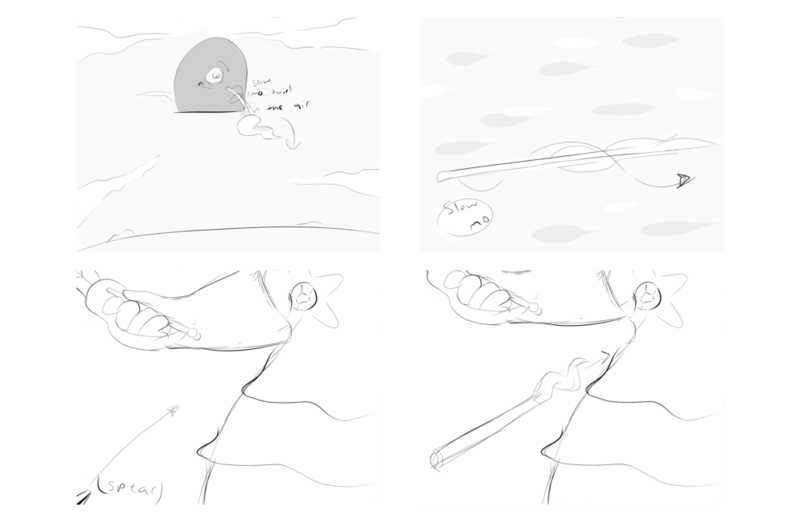 From storyboarding work pushing me outside my comfort zone I am growing as an artist and a person, and I am thrilled. I also adventured to a shoot with the team, and also another tough but rewarding experience. Getting to see the magic of cinematics is extremely amazing both in an experience and educational standpoint. I am hoping for more great opportunities in the future, and below is some samples from my assignments. The first assignment I got (known by “Fair”) is about this character who makes his living by being a clown. His life is not the easiest, but during a show he sees a child being dragged away by a man passing out candy. Sensing danger, he flees to the girl’s rescue and shoots the man to help the girl. The clown gets arrested for killing the man, but the clown did what he thought is best and is happy for that. This is a huge 80 shot story I boarded, so I provide a little sample from the work. In this scene he is contemplating shooting himself, but decides not to and goes to shower. The next project is a fish skydiving into a fishman’s hands. Confused, the fisherman looks up and sees a ton of fish falling. Possibly for some commercial project. From January 1st to April 10th 2016 I pushed myself to create work outside of class to hone my skills. Hence my 100 Days of Animation and Illustration project came to be. It really benefited me with learning more about animation and I enjoyed experimenting. The work ranged from illustrations to storyboards to animations. Everyday I put these on my Patreon page while doing the project. For those that have not heard of Patreon it’s a site where art can be pledge money monthly from people, and the artist provides with them with art, photoshop documents, WIP videos or other things. I plan to keep giving myself projects like filling sketchbooks or artist challenges to keep me drawing in the future. To see my Patreon page click here. Below is some samples of work I did for my 100 Day Project and to see all of it click here. Illustrating a friend's cat if they were more human (yes, they are a neckbeard). 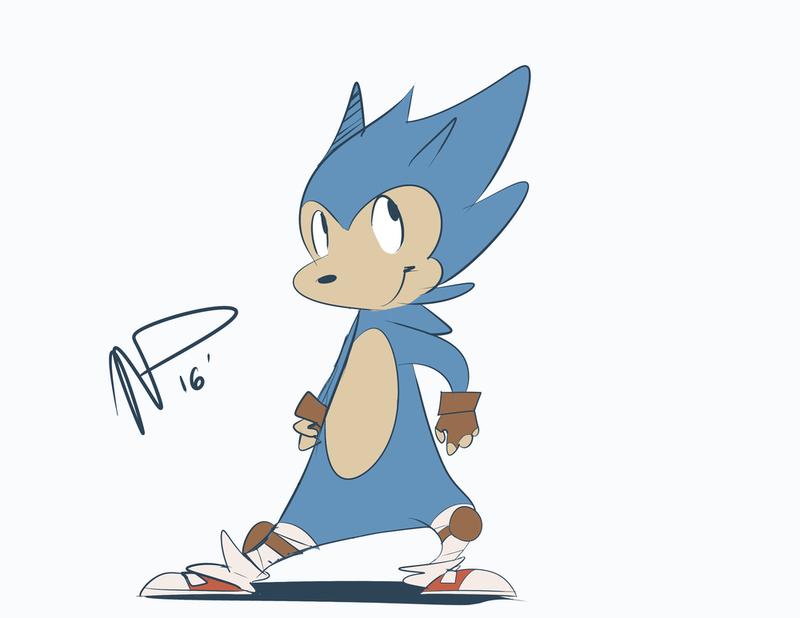 Sonic in someone's style to practice my cartooning. I spent a couple of weeks creating a story with boards and did animatics of some of the parts for practicing storyboarding and animating. This zine (mini magazine) is studying the style of one of my big inspirations, Rebecca Sugar (creator of Steven Universe). This is including researching her inspirations and showing the similarities in her style with her inspirations. This also goes into detail of how she sketches, shades, etc. to get the most authentic “Rebecca Sugar” look. I do both studies of her own sketches and applying that knowledge into my own sketches of her Steven Universe characters in that style. In Character and World Design our class built a world and each group built a race in that world. The race I created is the Wugoys which is a group of monkey-like creatures that can glide around, but are unable to fly. The Wugoy live in the sky (or the ground since this world’s design is based on the holo world theory), and they do not leave since they cannot fly back there. Breakdown explaining the silhouettes more. Anatomy Breakdowns of how the wings work. Mat painting depicting the world of the Wugoys. A game I worked on with three other people (one other artist and two programmers). The game is a super smash brother’s style fighting game, but you use blocks as the means to fight instead of punching or kicking. The world is a fantasy world created in the minds of the children (the playable characters). For this project I did all the animation work for the characters. I did about two- three passes overall for each animation, and the first pass I spent the most time ironing out the sketches and learning character movement. For more of my animation work on the game click here. I also did some graphic design work for the blog and business card to pass out at the booth when presenting the project. Also created the UI for the game. First Concepts of the Business Card. Went with the simple look of the top left. More Iteration: Playing with Contrast and Brightness. Messing around with another design still go with the one above. Iterations for Final Look. Went with #1. Our booth to present the game for people on campus to play. Including the business cards I designed as takeaways from the game.